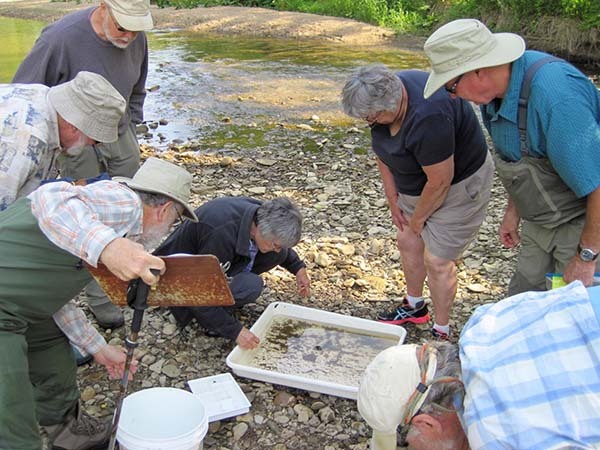 Beginning in 2012, chapter members have been sampling Apple Creek for macroinvertebrates at 2 sites one to two times a year. 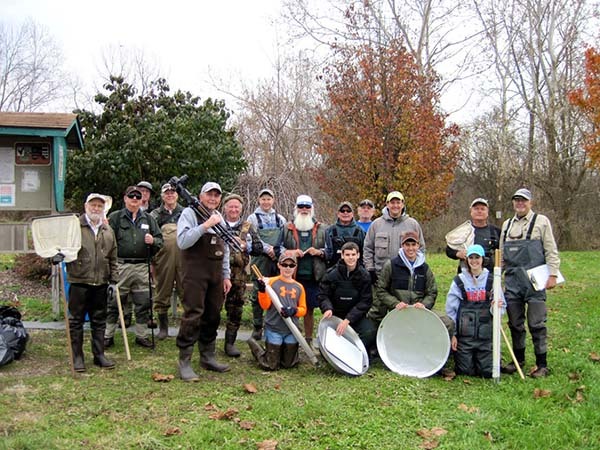 Sampling tools are dip nets and kick seines. 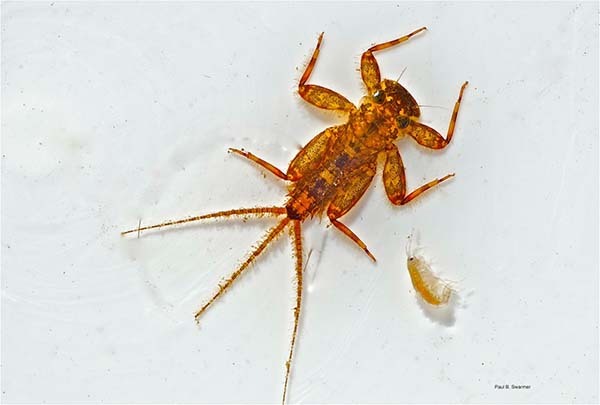 A diverse array of invertebrates has been recorded, especially those taxa (mayflies, caddis flies and stoneflies) sensitive to water pollutants. 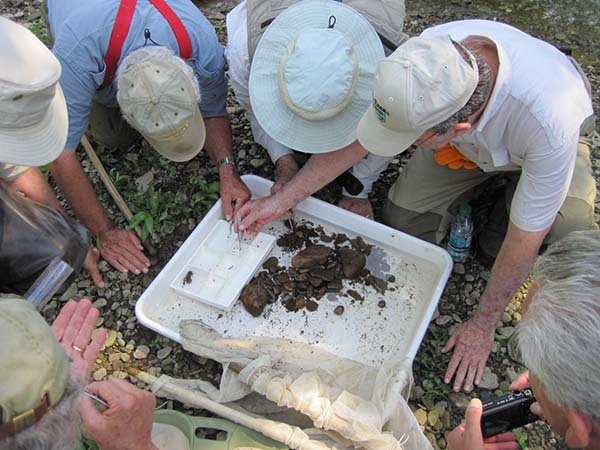 An assessment of macroinvertebrate diversity is used to calculate a pollution index of stream water quality . in Apple Creek. 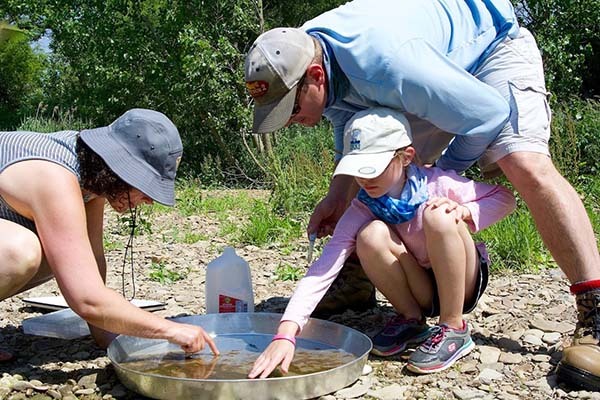 In all surveys at both sites, water quality has registered as excellent. 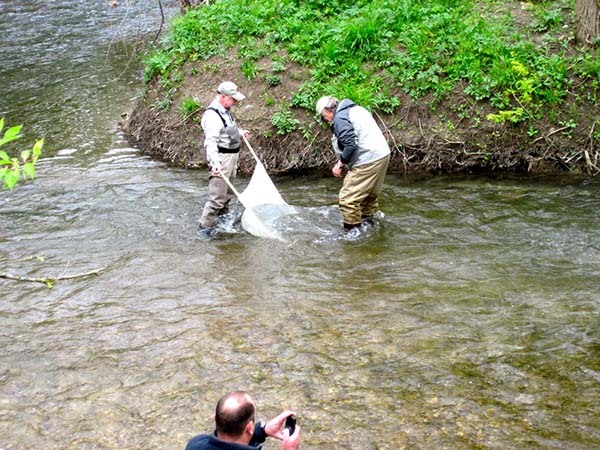 Macroinvertebrates in Apple Creek serve as a major food source for stocked trout and serve as indicators to fly fishermen what fly patterns can be successfully fished. Click on pictures for a larger image and captions. Getting ready to sample macroinvertebrates in Apple Creek. Checking for bugs in a dip net sampler. Positioning a kick seine in riffle water to sample invertebrates. Kicking up gravel to catch invertebrates in the kick seine. Getting heads together to separate invertebrates from a kick seine sample. 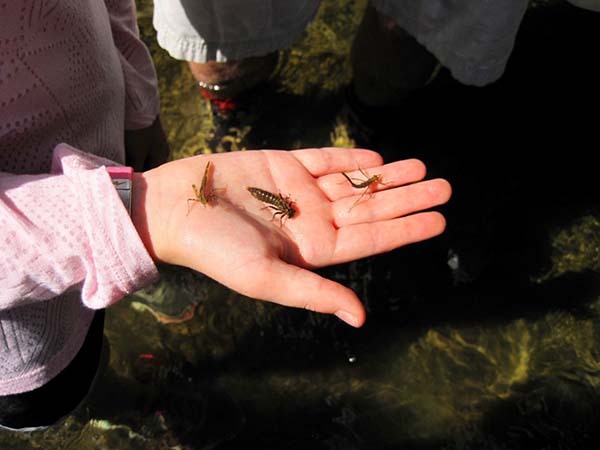 Kids love to be involved in sampling macroinvertebrates. Even some who do not fish, love to sample the bugs. 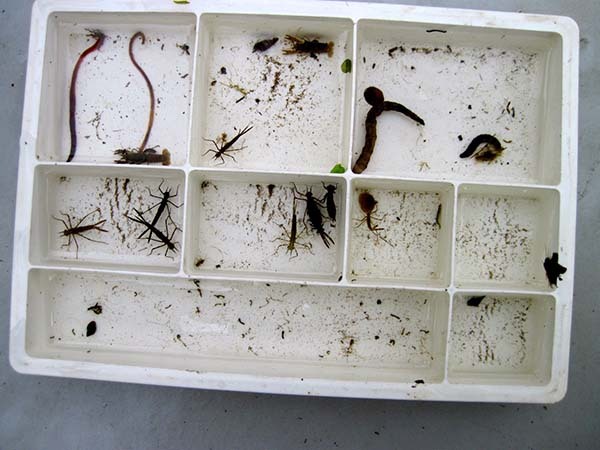 Tray showing macroinvertebrates separated by taxa. A dragonfly and two damsel fly nymphs. A common caddis fly nymph in Apple Creek. 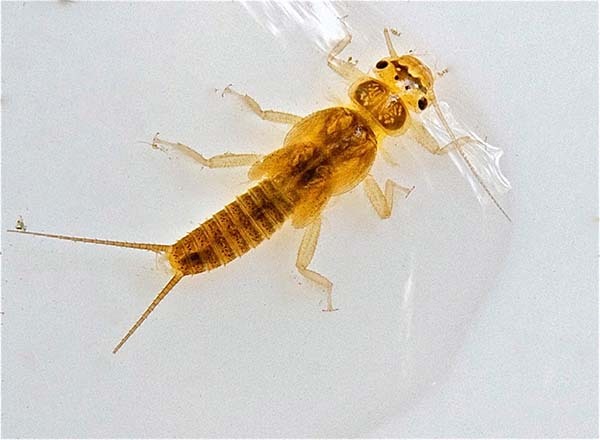 A big mayfly nymph from Apple Creek. Also that is a small scud next to the mayfly. An Apple Creek stone fly. 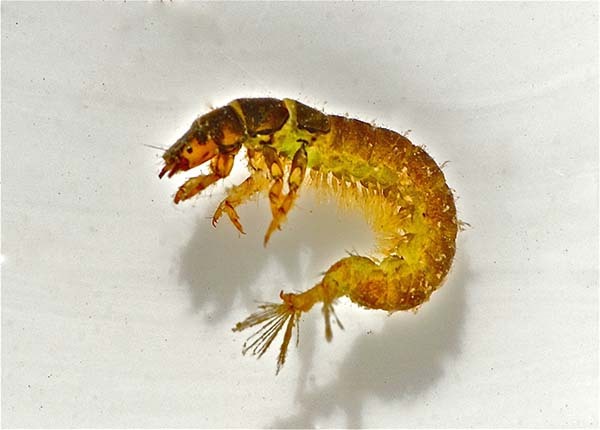 Caddis and mayflies are more abundant in the stream than stone flies. 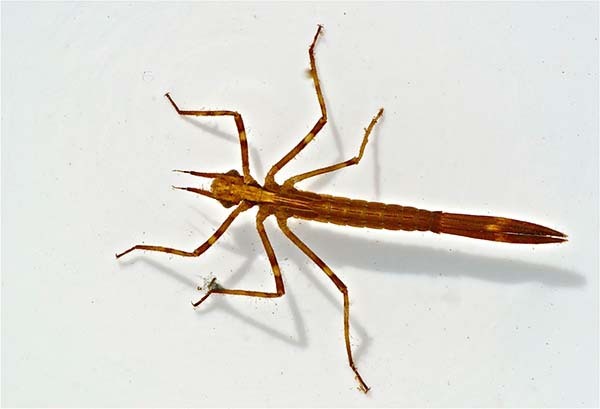 A damsel fly nymph from Apple Creek. They are abundant clinging to underwater vegetation along the shore and show up in dip net samples.